I don’t know about you, but I enjoy reading children’s books. They just seem to say a lot more in fewer words. 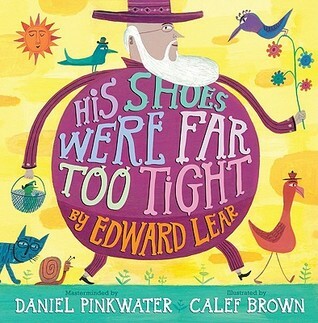 I recently read His Shoes Were Far Too Tight by Edward Lear. The book is the mastermind of Daniel Pinkwater, and it is illustrated by Calef Brown. The book is a collection of poems by Edward Lear. A lot of people will recognize one his most famous poems The Owl and The Pussycat. As the title suggests it is the story of an owl and a pussycat. The owl and the pussycat are in love, and the poem follows their journey to find a ring, and someone who will marry them. While Lear’s poetry is considered nonsense poetry, this poem has always made great sense to me. It shows how no matter how different individuals are love can make it work. I think the poem says a lot more than people realize. And I really like the illustration that Brown put together for this poem. It’s a picture of the owl serenading the pussycat while they are in a boat. Just like the poem says, but the owl and the pussycat obviously adore each other. It’s a great picture of what true love is. My absolute favorite poem in the book is The Jumblies. They went to sea in a sieve. Now a sieve isn’t something you would normally think of floating around in, but the jumblies sail off in the sieve even though others say they shouldn’t do it. They sail off into bad weather. And the jumblies are very proud of the fact that they have sailed off in the sieve. Once again Brown has delivered a great illustration for this poem. The picture of individuals with green heads sailing into the unkown in a sieve is something most children will enjoy. So, as you make out a list of items for your children’s Christmas list, and you want something that they will use over and over. Add this book to the list of purchases, it’s a book they will enjoy. Sounds like a fun book. As a teacher I’m always looking for new read alouds that are engaging. Just by looking at the cover it seems that the illustrations are in vibrant colors and my students love that!